Matthew graduated from RMIT University in Australia in 2002 with a double-bachelor degree in Clinical Applied Science and Osteopathic Science. He practiced as an osteopath in Melbourne, Australia, for seven years specializing in manipulative therapy. During this time he owned and was principal therapist at his own clinic and taught Osteopathic Manual Technique and Clinical Proficiency at his alma mater. In 2009, he immigrated to Canada and subsequently moved to Seattle in 2011, where he was accepted into the University of Washington’s DPT program. 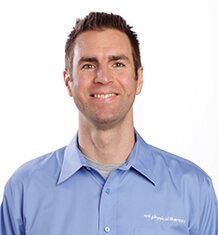 After completing his Doctorate in Physical Therapy in 2015, he joined MTI Physical Therapy in August of that year. He completed a residency in Orthopedic Manual Therapy through the Ola Grimsby Institute in January 2017. Matthew is a teaching affiliate of the Ola Grimsby Institute and since 2012 has instructed continuing education courses in extremity manipulation and osteopathic technique across the United States. He also has experience playing and coaching in professional basketball leagues, and has written professionally on sport for national and worldwide news sources. Away from his PT practice, he plays Ultimate Frisbee and Australian Football, is a voracious reader, and loves to hike and spend time outdoors with his family in the Pacific Northwest.